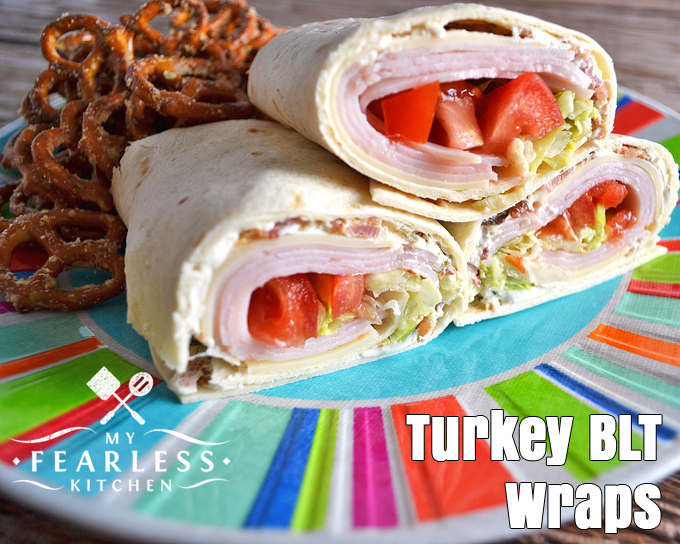 These Turkey BLT Wraps are the perfect fast, easy, healthy, and filling lunch! Great for a leisurely lunch with friends or a fast lunch on the go. Everything is better with bacon! Summers are busy for everyone, and farmers are no exception! This summer has been one for the books… with all the wet weather we had, it was very hard to find the right time to get all our hay cut! We had a very wet spring, and the rain continued to come all summer long. The warm wet days meant that our hay grew great! But it also meant that the ground stayed very wet and muddy. It was hard to find a time when the ground was hard enough that we could drive a tractor in the fields! “Putting up hay” in Indiana is a 4-step process that takes a few days. Before we can start, the hay has to get to the right stage of growth – tall enough and mature enough that there is plenty of nutrition in the grass. Not too tall or mature or the nutrition content starts to drop off. Once the hay is ready (and the ground is dry enough to drive a heavy tractor on), that’s where the fun begins. We need to watch for the right “weather window.” Putting up hay takes a few days, so you want the weather forecast to have no rain in the future for at least the next 4 days. Warm, dry, windy days are the best for drying hay. If it rains, or if it is really humid, drying the hay can take a few extra days. When John decides the weather is right, he’s off and running. First, he mows the hay. Second, he goes back over the field once a day for 2-3 days and teds the hay to help it dry. Third, he goes back through the field and rakes the hay into large piles called windrows to get it ready to bale. Fourth, he uses a baler to scoop up all the hay and pack it tightly into giant round bales of hay. Finally, he goes back through the field (again!) to pick up all the hay bales and bring them back home. We store the hay in our barn and feed it to our cows during the winter. And all this happens during John’s time off from his “real job” as a veterinarian! Because summers in general (and hay season in particular) are so crazy, I’m always looking for fast, healthy, and filling lunch ideas. These Turkey BLT Wraps (from Mom Knows Best by Gooseberry Patch) were just the thing! Grab a handful of Garlic-Parmesan Pretzels, and lunch is ready! What is your go-to fast and easy lunch? Turkey BLT Wraps from My Fearless Kitchen. 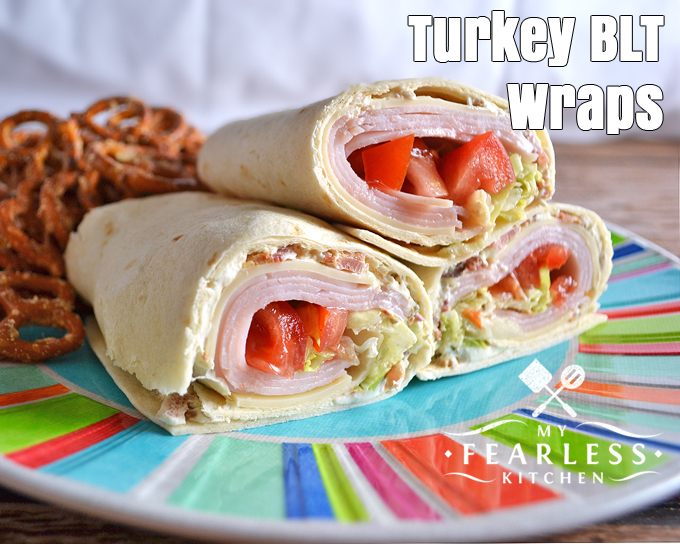 These Turkey BLT Wraps are the perfect fast, easy, healthy, and filling lunch! Great for a leisurely lunch with friends or a fast lunch on the go. Mix together cream cheese and bacon. Spread ¼ of the cream cheese mixture over each tortilla. Top tortillas with turkey, tomatoes, and lettuce. Roll up tightly. Stores well refrigerated for 24 hours, wrapped tightly in plastic wrap. « Are There Antibiotics in Milk?